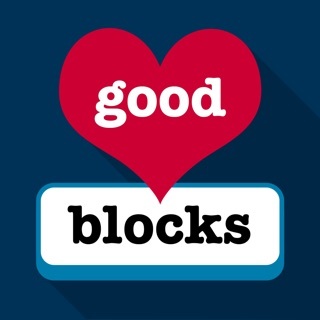 Do you suffer from anxiety or panic attacks? Issues sleeping from jet lag or insomnia? Having trouble managing stress from work and life? 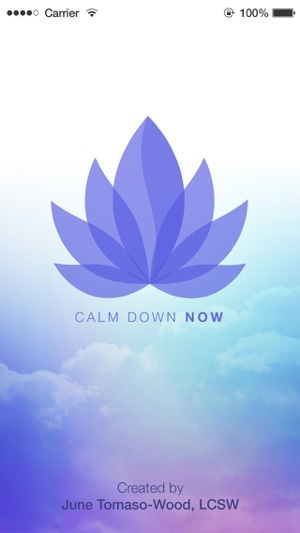 Calm Down Now® is the leading app for relief from these difficult problems. 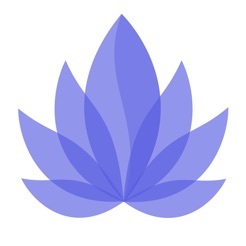 Listen to guided relaxation audios spoken by June Tomaso-Wood, learn empowering techniques in the animated handbook (including tapping eft) or custom mix a variety of your favorite relaxing sounds. 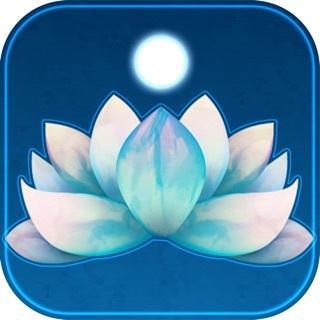 Combining the top methods for instant relaxation and overcoming anxiety, this app empowers you every time! Created and by noted psychotherapist June Tomaso-Wood, LCSW. 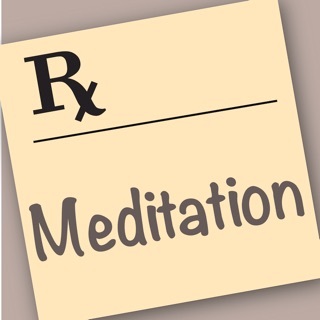 Her experience in using these techniques has proven effective in reducing stress and anxiety in her life and in all the lives she has touched as a psychotherapist for the last 30 years. This is the definitive anxiety app. √ 3 Animated empowering techniques, including the popular Tapping in Tranquility (eft) & Positive Affirmations. 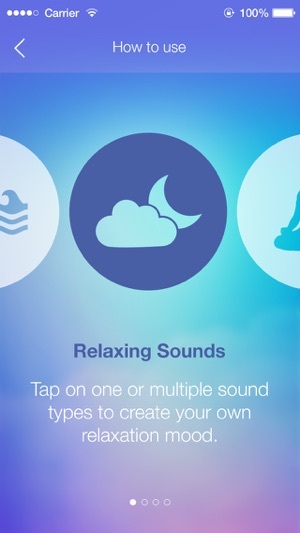 √ Mix your favorite relaxing sounds together to create your personal soundscape! √ Play sounds in the background while using other apps! √ Custom Timer. Choose how long you want to listen to relaxing sounds! √ Connect to Airplay devices! This mobile application is not designed to be listened to by anyone suffering from epilepsy or severe mental health issues, including, but not limited to, psychosis. The information and guidance given by June Tomaso-Wood in this mobile application is not intended to diagnose, treat or cure any disease, illness, condition or state of mind. If you are unsure of the suitability of this mobile application in anyway, please consult a medical practitioner before listening. It is especially important to seek advice from a medical practitioner in cases of mental health disorders or severe health conditions. If in any doubt, please ask. The decision to install and use this mobile application is entirely yours, the owner (June Tomaso-Wood) and production team (Calm Down Now, LLC) behind this application except no liability for it's use. This mobile application should not be listened to at a time when you cannot safely close your eyes and relax fully, do not use while driving. I suffer from Generalized Anxiety Disorder and Panic. I just used this app for the first time this evening and am so calm. I started this evening very anxious so I took a short walk hoping the warm air would help but I still felt very tense. I sat on my porch and read some passages and that helped a bit however when I came inside my panic returned full force. My head was racing and I felt sick and the thoughts kept coming. I grabbed my phone turned it on and played stop panic now. The breathing exercises helped bring me right back down. The woman's voice is soothing and clear! Well worth it! So easy to use and extremely helpful. 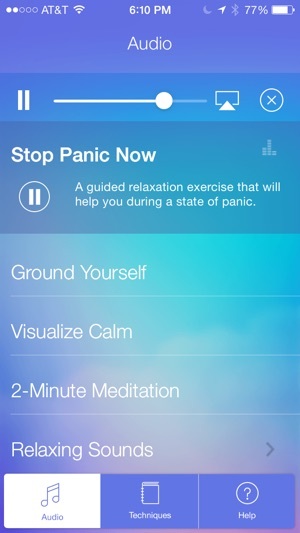 Even a person without panic disorder, clinical anxiety, or insomnia can use this app. It's almost like hypnosis. 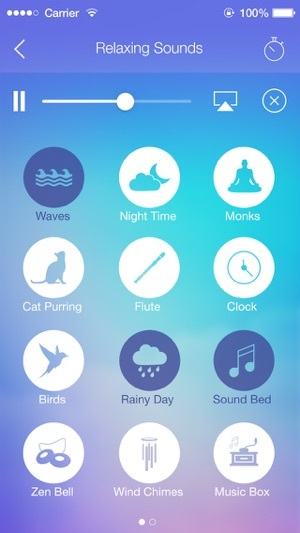 I have only used the relaxing sounds section, but after one trial, I turn to it daily. What's magic is that it is so sure-fire. The choice of sounds means you can vary the combinations: light rain plus Zen bell, etc., or change them within a listening session. The tech and sound recording are good, there are so many frequencies, even a low rumble for a sound floor, that even partial deafness won't prevent you from hearing enough to work. A very valuable little tool for everyday life! What I particularly like about this app is that there are numerous and varied choices of relaxing sounds + a timer so that I can go to sleep listening to thunderstorms, for example. I set the timer for however long I want, and I'm not concerned about the sound interfering with the alarm on my iPhone or iPad because the sound will have stopped several hours before I need to wake up.